Second; for those generous enough to donate, so I can more easily help people in the community (without it becoming a financial burdon on my family). I love helping people. I’m obsessed with helping people. My unique life story has placed me in this place in time where I am able to help. I’d love to have a few of these items stored at my home to hand over to the folks wanting to make changes, but are too negatively altered by the toxins, which has led them to a point in life when they aren’t able to help themselves (mentally and/or financially). Sometimes one person showing they care is all an ill person needs to begin healing. If you donate, that will be at least two of us (and I’ll be sure to let them know). I’d love to be able offer more than information and a shoulder to cry on as the realizations sweep over their faces. If you can only afford yourself, please do not financially burdon yourself to add to my giveaway pile. Care for you. The whole, “Put your face mask on before you try to help another” applies here. 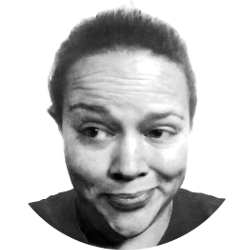 Continue choosing your health first and your bank account will eventually follow suit… then I’d love a donation. Pass on the goodness only when/if you’re able. Update: It’s been six weeks and all of the above is still going great!!! 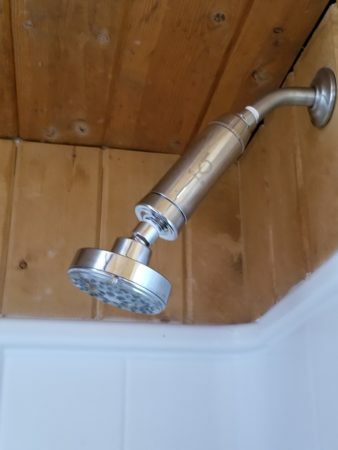 Water pressure has NOT SLOWED. I am beginning to notice some bronzing in my hair (NOTHING LIKE BEFORE THE FILTER), which tells me it’s not working at full capacity anymore, so I will likely replace in the next week or two and then move the used filter to our washing machine inlet. 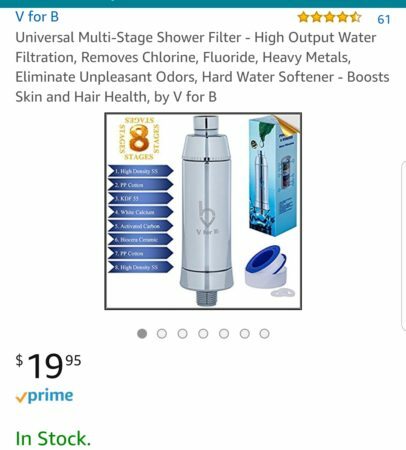 I recommend this to you IF you currently live in the areas from the Mackinac Bridge to Kalamazoo and your home is drawing water from a ground source. The city/town water treatment plants do so much, I have no idea if the chemicals already added would be okay in this filter. Some day I may look into this, but for now, definitely on the back burner. However, I have some non-water recommendations too. Future posts will still be of interest to you. Don’t leave me just because you drink city water. 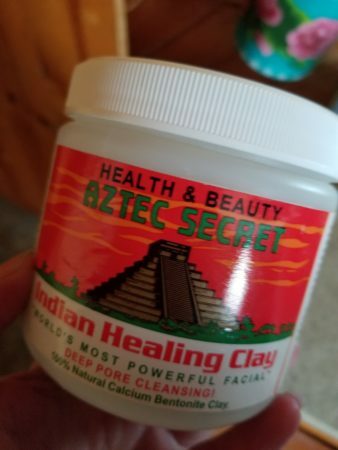 Aztec Secret, Indian Healing ClayThis dry clay is definitely worth it’s low cost. I have owned this container for 6 months and am not going to need more for another month. 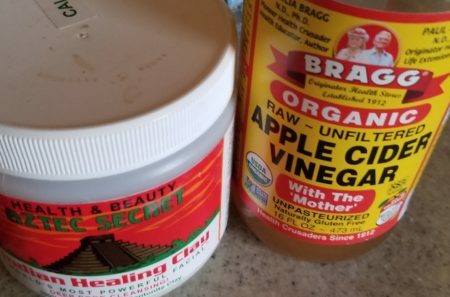 I’m using it as a mask after mixing with apple cider vinegar (for best results). My 6 year old uses water to mix (also recommended on the directions) because she can’t stand the apple cider vinegar smell. She loves the foot massages I give her with it. Help’s “draw out” infections/toxins in wounds that won’t heal without assistance. Surprisingly, the vinegar doesn’t burn even in wounds (I avoid antibiotics at all costs, so I try this before ever going to the doctor). Visit Clinton Zimmerman, CTN, and owner of Red Fox in Big Rapids, MI. A few months ago I was at a point in my research when I couldn’t find anybody who understood what I was talking about. He was the VERY FIRST person who understood why I see this as something vital for our community to understand. Thankfully, he has a health store, where he takes appointments. He does not accept insurance and charges $100 for an hour of his time. During that time, it’s up to you and him about what will best help you. The services he offers seem endless. He is an amazing person for you to follow up with beyond the simple, huge impact solutions I’ve recommended above. 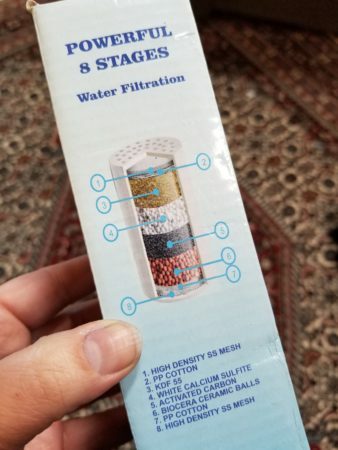 I am confident in his comprehension of the problem and was relieved he had more solutions than “filter your water.” The solutions he recommends for almost everybody in this area will cost you under $30. We’re beyond lucky to have such an amazing resource in our community.